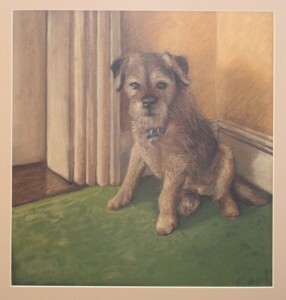 Border terriers are renowned for being healthy and lively well into their old age. 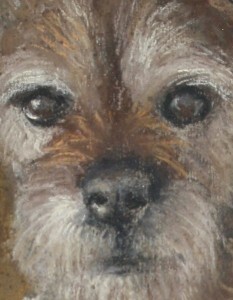 When my little dog suddenly slowed down at about 15 years old, I not only started him on painkillers and Aktivait but also made it my priority to do this portrait. This was two to three years ago. I used a mixture of hard pastels (my collection includes both Faber-Castell and Pitt pastels) and soft ones (Rembrandt and, my favourite brand, Unison) for this picture. Unison pastels are both round-ended and soft so are not the obvious choice for making fine lines. However, I really am seduced by their superb colours and do find myself working with shards of broken Unison pastel even for hairs and whiskers. A sense of place. I wanted to show Freddy in this corner of our upstairs landing. 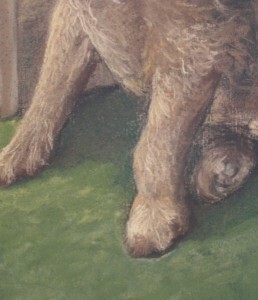 At the time of making that drawing, this was where he would sit (usually ignoring his own bed), and he would be ready to greet people coming either up the stairs or out of nearby doorways. A combination of 3D form and overlying hair. This was a two-step process. I decided to block his body shape in with light and dark tones of pastel, then to suggest individual hairs over the top of this. A memory. Yes, there is a little success here. It wasn’t long before Freddy couldn’t get up and down the stairs on his own so this picture does mark a point in time. Yes, it is unashamedly sentimental. But so am I. And it did capture his kind expression. I worked from a selection of my photos but kept running out to the landing to look at Freddy in order to get the details right. Thanks for the compliment, Kaye. I wonder where to draw the line between “sentimental” and “sensitive” in portraits? It is interesting how a single portait may show just one side of someone’s character and that, once the sitter is long gone, the biased image still lives on. This Freddy picture only puts across his sweet and kind side, ignoring his mischievous tendency (running off, mud-rolling, food-thieving and play). The most fascinating portraits suggest that the sitter has a complex personality and really make the viewer think. I aimed for something a bit different here, a picture by and for myself that could be as self-indulgent as I wished.